“The animals are more innocent than humans.” “Noah” – is the Year’s First Must-See Movie! Jennifer Connelly as Naameh is superb. Synopsis: When the World goes into darkness. When man kills man, brother kills brother. When there is no mercy left, but only inhumanity and unkindness. 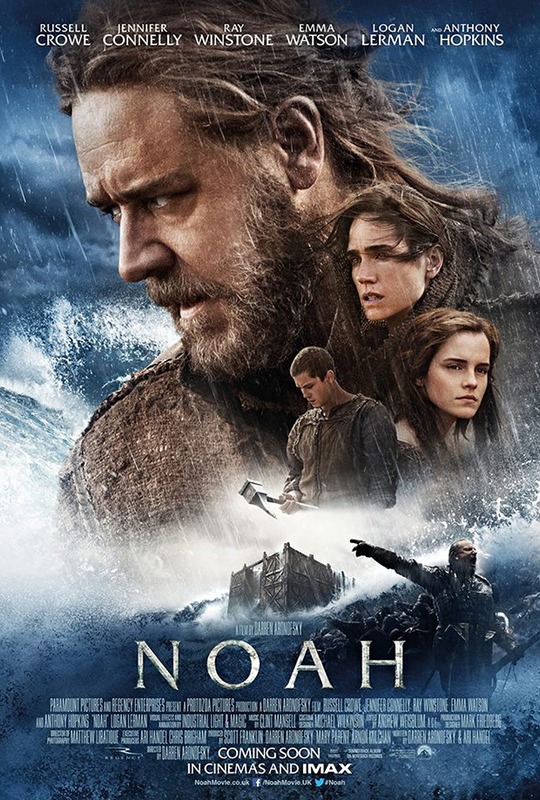 When the animals receive more compassion than humans; The Creator speaks to Noah (Russel Crowe) through a series of mysterious dreams and asks him to save his wife Naameh, his sons Ham (Logan Lerman), Shem (Douglas Both) and Japheth (Leo McHugh Carroll), and Shem`s wife Ila (Emma Watson) who was adopted by Noah as an infant. Noah, through his dreams, is informed by The Creator that the world will be destroyed and no one but Noah and his family will survive, along with the animals. The new film, “Noah”, stars Russell Crowe as the man chosen by God to collect pairs of all the Earth’s animals on a massive ark to save them from a global flood. But how would Noah build that huge Ark alone? Darren Aronofsky offers us ‘The Watchers’, a race of fallen angels who are encrusted by hardened magma when they all fell from Heaven to Earth. Even though the Watchers are unfriendly with Noah, in the end they agree to help Noah complete his task assigned by God. They sacrifice their lives to protect Noah from Tubal-cain (Ray Winstone) because the Watchers believe that Noah is the man they were meant to help. Despite the Epic story of Noah`s Ark, Darren Aronofsky tells us a story of a Man, who is not just a hero, but an anti-hero as well. This makes his film even better. In “Noah” we will see everything from the flower that blooms from nothing, large scale scenes, ; ‘The Watchers’ who look something like “The Transformers”, the animals when they arrive and board the Ark, the flood, and the destruction of the World. Additionally, Noah is determined to complete his task and believes that only the animals should survive. He believes that after the flood, he will have to kill his wife and children, as well as himself, to prevent sinful humanity from angering The Creator again. But what’s the point of destroying the World if the humans still have no humanity? Officially the Oscar 2015 race can begin with “Noah”. Why do I think so? Well, there are a couple of strong keys that might help ‘ Noah’ to be nominated for the Oscars; the Stunning Visual Effects, costumes, sounds, and more than anything, the story, that will captivate you throughout the film. If you have seen the movies directed by Darren Aronofsky such as “Requiem for A Dream”, Black Swan”, and “The Fountain”, you will understand what is most important to Darren. He can conquer your heart, not just with stunning cinematography, visual effects, and a story that will stay with you long after the movie is over, but Darren Aronofsky also uses any available opportunity to demonstrate the dark side of humanity. If you have had a chance to see the films I’ve mentioned above, then you would agree with me. But without good actors, Darren Aronofsky would never have been able to achieve what he has achieved with Noah. Academy Award winner Russell Crowe , who stars as Noah, will bring you two sides of Noah; a good and a bad side. Russell knows exactly how to disappear into the character he plays. In my opinion, Russell was quite emotional in a couple scenes. He can make his viewers love him and hate him at the same time. It’s definitely not the performance of the year, but his acting was quite solid. He convinces you throughout the movie that his mission will be a success. Jennifer Connelly has shared the screen with Russell Crowe before in “Beautiful Mind”, which brought her many Awards, including an ‘Oscar’. She also has had experience working with Darren in “Requiem for a dream.” In “Noah”, Jennifer is superb as Naameh. Her dialogue with Noah left me absolutely speechless. She delivered her performance of the year. Unfortunately, watching the movie at the theater limits you in many ways. If I were allowed to replay the same scene as many times as I wished, I would definitely do that, just to enjoy Jennifer’s breathtaking performance over and over again. I have to admit, I was quite surprised seeing Emma Watson`s performance in ‘Noah”. As Ila, she was absolutely stunning and unique. The scene on the Ark with Noah is the beginning of Emma`s brilliant acting career. If she continues to act the way she acted in “Noah” – she will have a very bright future. 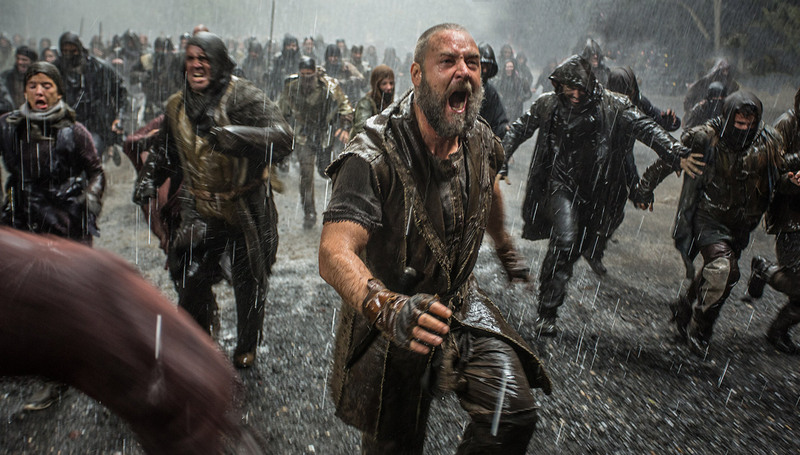 Darren Aronofsky brought us a different Noah: – a Noah that can be good and bad. He goes to great lengths to save his family and the animals. In the end, he does not fail the Creator and proves that love, compassion, and mercy is all that we need to live our lives with dignity.